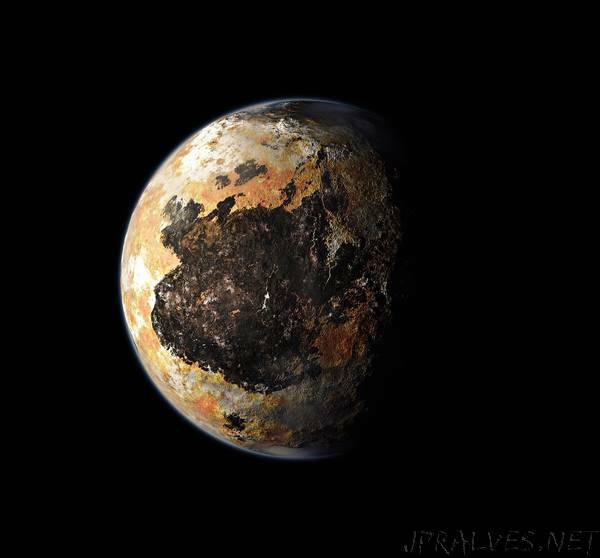 “Analysis of NASA data finds the dwarf planet has a highly dynamic environment. Phil Dooley reports. There are dunes on Pluto made of methane sand, the scientists studying the data from the NASA 2015 New Horizons flypast have announced in the journal Science. When they first saw the images from New Horizons, the researchers, led by Matt Telfer from the University of Plymouth in the UK, thought they looked like sand dunes on Earth, but didn’t believe their eyes. With an atmosphere 100,000 times less dense than that on our own planet, there seemed no possibility that Pluto experienced strong enough to move any particles about. The scientists began searching for explanations for 357 dune-like ridges and six dark streaks on a large plain called the Sputnik Planitia, next to a range of high mountains. One hypothesis was that they were pits formed as the weak sunlight warmed the icy surface comprising nitrogen, methane and carbon monoxide, turning it from solid to gas, a process called sublimation. But under such constraints, the pits should have been at right angles. However unlikely, to Telfer, the dune theory seemed to fit much better. “They make perfect sense, almost down to the degree, the results look marvellous in terms of the alignment,” he says. The team turned to Eric Parteli at Cologne University in Germany, to better understand. Parteli modelled the conditions and found that despite the thin atmosphere, the extremely low gravity on Pluto – one twelfth the strength of Earth’s – meant that grains of solid methane in the air would stay up long enough to be blown into dunes. One question still remained: how could such tenuous winds kick particles up into the air in the first place? It was here that the sublimation came into play. Gases rising from the icy surface are enough to lift a few particles in to the air, where the wind, with speeds similar to those on Earth, could sculpt them into classic dune shapes. Parteli’s analysis showed another surprise: as each particle landed, it should knock a few others up into the air – a kind of splash effect. Once a couple of particles were up, their landing would propagate the “sand-storm”. A final boost for the team’s conclusion came from the modelling of the methane sand grain size. To match the dunes, spaced between 400 and 1000 metres apart, the model suggested grains between 0.2 and 0.3 of a millimetre. This was a close match to the New Horizons team’s measurements of the optical properties of the surface, which concluded the grains were between 0.2 and 0.4 millimetres. This means the grains of methane are of similar similar sizes to Earth’s silicon dioxide sand. It is another part of a surprisingly recognisable picture for Telfer. “It’s exciting that we can go to such a remote, exotic, unusual landscape, at minus-233 degrees Celsius, and yet come out with something that is reassuringly familiar,” he says. “We have snow – or grains – blowing around; material coming down from the mountains forming dunes on the ice cap below.